Pastor Roy Rocha recently wrote as follows…. Aimee is a grade 10 student. She was diagnosed of ovarian cyst in her left ovary. The left ovary was removed after her surgery last week. The initial result of the cyst was found to be Malignant (stage 1). Now, she is home with her family after 21 days stay in the hospital. Their next thing to do is for the chemotherapy. Please help Aimee in prayers and support as she is on recovery. Her family is not capable of sustaining maintenance and chemotherapy fees. Her father is just a simple carpenter and her mother only sells dried fish. Their hospital bill was Php. 50,000.00. I am bringing this special prayer request because she really needs help. The family is a new attendee of our church. They were former member of a known cult group “Iglesia ni Cristo” that denied the deity of Christ. Because of this, some of their relatives refused to extend support to them. Yesterday, they came to our house to extend their thanks to us. 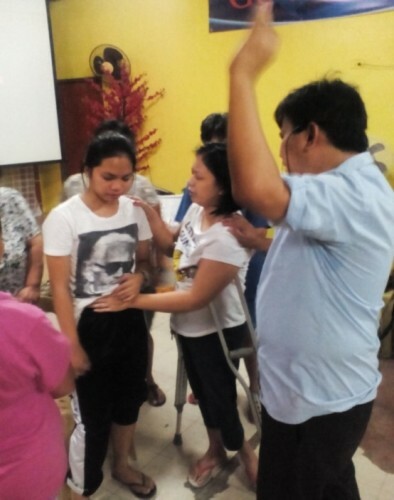 Our church did the best way we could help them in assisting during their needs. Please pray for fast recovery and healing!